During my years of practice, these two postures gave me a lot of trouble (honestly all of them did). But Trikonasana pulled on my back to distraction and I could not reach far down with my hand. Until I really learned what was the important focus in Triangle and how to MOVE INTO it, I was doomed to misunderstand it. Until I learned to slowly go in it (over days not seconds of practice) and in my own time (years of practice), I was constantly uncomfortable. The key was to move slowly and to stop when I felt the pull too strongly then I knew I was in the posture to the best of my body’s ability. Working from the hips rather than the head or hand really helped me understand that to open into this posture was to allow my own hips and legs to let go of one another. How did I do that? Move slowly, work from the movement of the hips on top of the straight leg and then things slowly started to release. Soon I was able to reach my fingers close to the floor – although that is still not my focus (nor is it the posture’s focus). Parsvakonasana was a different experience entirely. My hips needed to slowly release the top of my thighs in order to essentially squat into the posture and be able to lay my torso over the bent leg, open up, and reach my arm overhead. It was the same focus however – work from the hips as if I were squatting down and the back leg strong. The hand was the least of my worries – and so it should be. With a combination of hip openers, patience and practice, I finally was able to feel what this posture was all about. While these two postures ask the same from you – the hip and leg muscle relationships are different because of the either the straight leg or bent knee. As well, you can see that the lower body and upper body relationship is quite different. In Trikonasana, the upper body is at 90° (in full posture) from the lower body, and Parsvakonasana the upper body is essentially in alignment with the lower body. This difference alone changes your bodies dynamic in each posture. When doing each of these postures, they need to be understood each on their own terms because they are different. I think the problem comes when the hand on the floor or close to it becomes the focus – which it is not. It is bad teaching when that becomes the goal. The fingers or hand need not reach the floor (at least not yet). Truly to do each posture to your best ability the key in each is whether the front leg is straight or bent. 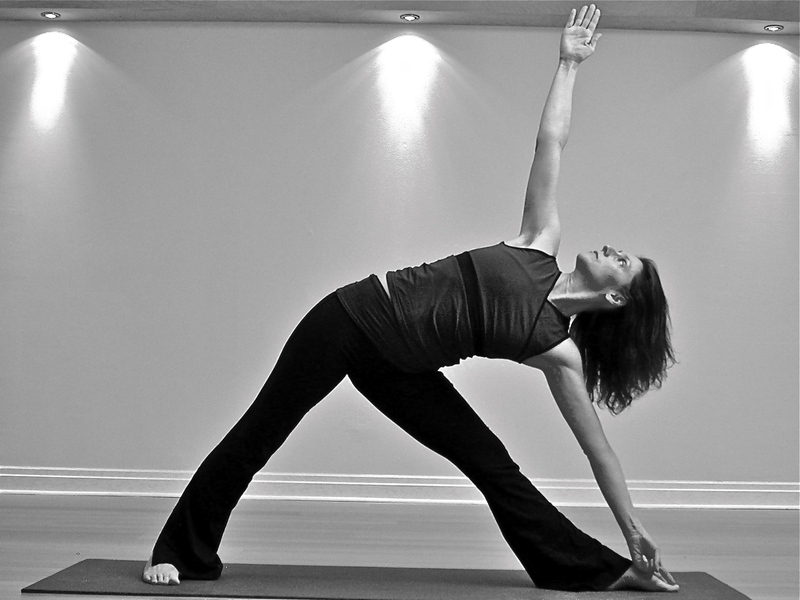 In Trikonasana – the front leg stays straight. Do not compromise yourself or the posture by bending the front knee. If you can not bring the torso down like in all the pictures (who can) just give yourself time. Take your time by focusing on the hip movement. It’ll move – just give it time! And I mean real time – not 30 seconds or 5 breaths. Take it slow through days weeks months. Keep practicing. If in Parsvakonasana you can’t reach the hand down – not to worry. Work with the focus of squatting down into the the bent knee’s hip and work from there. Trikonasana – front leg is Straight; back foot toes pointing out to the side (mainly); front hand is usually along side inner shin, fingers extending, palm open or sometimes grabbing the toe; top arm extended straight up. 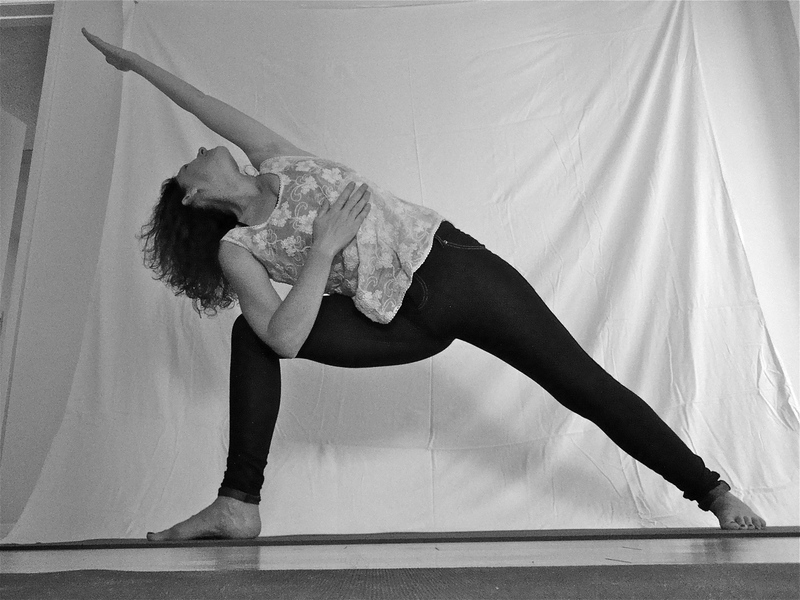 Parsvakonasana – front leg is Bent 90°; back foot is turned in 45°; hand is on the floor (usually); top arm extended over ear. This is to help you Recognize these postures. This is Not meant to be Instructional – although it can be when you’re want it.